UPDATE: Boyle will sit according to AV. McIlrath will play. After another grueling road win against the Ottawa Senators, the Rangers (13-2-2) return back to Madison Square Garden to take on the struggling Toronto Maple Leafs (5-8-4), looking to add on to their best start in franchise history. After everyone talked about the Montreal Canadiens quick start to the season, the Rangers have taken the league by storm, possessing the best record in the NHL and a tie for the most amount of points (28) of any teams. In addition, New York has won eight straight games, as well as recording a point in 12 consecutive games (10-0-2). They’ve won 10 of their last 11 games (10-0-1), and have matched a franchise best for points through the first 17 games, and set a new record for wins through the first 17 games to begin a season. Tonight’s contest is the second of three games between the Rangers and Maple Leafs, and the last one that will take place at Madison Square Garden. 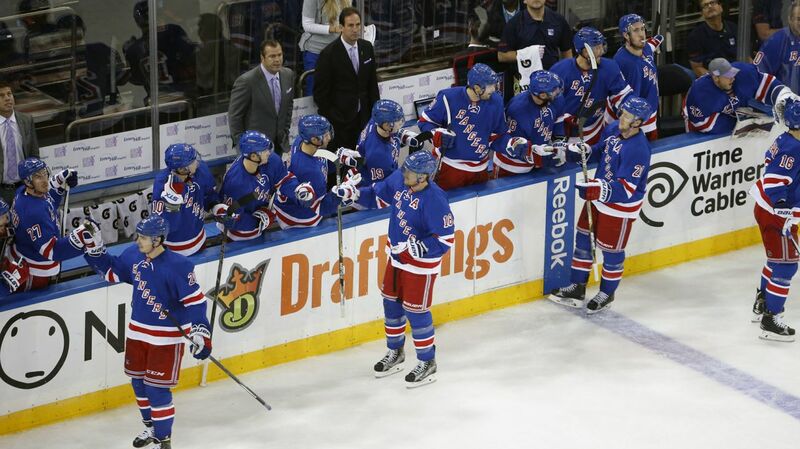 The Rangers won the first game, 3-1, with all of the goals coming from Mats Zuccarello in his first career hat trick. Brassard and Nash each had three assists. The Blueshirts are a force to be reckoned with on home ice, posting an 8-1-1 record at the Garden, currently holding a seven game home win streak. Toronto have picked up three of their five wins on the road. Even with Mike Babcock as the head coach, the Maple Leafs have struggled to do much of anything right. They’re averaging 2.24 goals per game while surrendering 2.94 goals against each game, although they are coming off of a 4-2 win over the Canuck last night. They have picked up at point in six of the last seven games. Their goaltending is very much a platoon role right now, with the teaming leaning towards whoever is playing well. James Reimer has been playing more lately, but he made 43 saves in Saturday’s win. Which means Jonathan Bernier will start. He’s 0-6-1 this season with a 3.02 GAA and a .899 save percentage. The leading scorer for Toronto is Morgan Reilly, a defenseman, who has 11 points (3-8-11) in 17 games. Loffrey Lupul and James van Reimsdyk both have six goals and three assists, and captain Dion Phaneuf has nine points (1-8-9). A big reason for the Rangers success has been their goaltending, with Henrik Lundqvist and Antti Raanta both playing excellently. The duo has combined to post a league best 1.51 GAA as well as a league best 9.51 save percentage, stopping 510 of the 536 shots they have seen. Antti Raanta has been marvelous this season, and will get the start tonight. Photo courtesy of Getty Images. 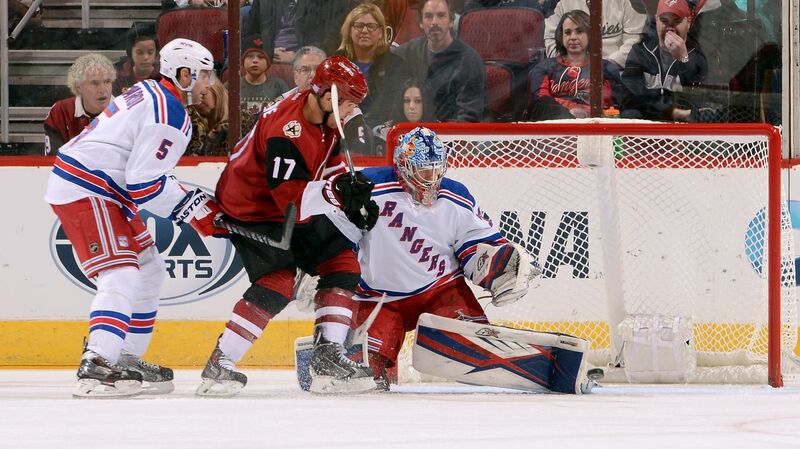 Raanta will likely get the start tonight. Since he’s entered the league in the 2013-14 season, the Finnish netminder has posted a 16-0-3 record when playing at home. That impressive record also comes with a 1.49 GAA, a .945 save percentage and four shutouts. Chris Kreider had a big game yesterday, scoring his third goal of the season on the power play and recording 17 penalty minutes after standing up for Derek Stepan, who was hit in the head by Zack Smith. Kreider has looked better lately, and seems to be slowly but surely finding his game. If Vigneault can get the second line going, it will be a big help in complementing the top line. Mats Zuccarello is the best player on the Rangers not named Henrik Lundqvist right now. Because of that, the top line will be a central part of this game. In the five games since Nash and Brassard were reunited with the Norwegian winger on October 30th, the trio has tallied 22 points (7-15-22). Kevin Hayes is enjoying a very successful sophomore season, posting 12 points (5-7-12) in the first 17 games. He has a goal in the last two games, six points (3-3-6) in the last six games and nine points in the last 10 games (4-5-9). 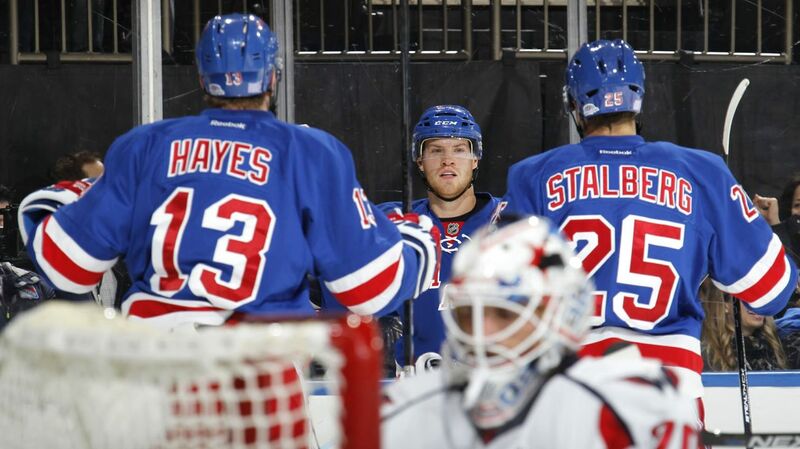 When Hayes does register a point, the Rangers are 10-0-1. Watch out for the third line. Photo courtesy of MSG Photos. Dan Boyle scored the shootout winner against the Senators last night, beating Craig Anderson with a perfectly placed wrist shot. He seemed excited, for obvious reasons, and hopefully it gives the veteran defenseman a confidence boost going into tonight’s game. I think he’ll have a good game, and he’s my player to watch. The Rangers and the Maple Leafs will face off at 7 PM at Madison Square Garden. The game will be broadcasted on MSG Network. Posted on November 15, 2015, in Game Previews and tagged Alain Vigneault, Babcock, Chris Kreider, Dan Boyle, Dan Girardi, Derek Stepan, Derick Brassard, Dion Phaneuf, Dominic Moore, Dylan McIlrath, Emerson Etem, Jarret Stoll, Jesper Fast, JT Miller, JVR, Kadri, Keith Yandle, Kevin Hayes, Kevin Klein, Marc Staal, Mats Zuccarello, MSG, New York Rangers, New York Rangers blog, NHL, NYR, Oscar Lindberg, Rangers, Rangers blog, Rick Nash, Ryan McDonagh, Toronto Maple LEafs, Viktor Stalberg. Bookmark the permalink. Leave a comment.